ALWAYS familiarize yourself to “where you are” and be sure to know how to reach the TWO nearest EXITS. Remember that in a fire situation, smoke is blinding and will bank down in the rooms and hallways. This condition may force you to crouch or crawl to escape to safety. By ALWAYS being aware of your surroundings, your knowledge of the nearest EXITS and having a PLAN will greatly increase your ability to deal with sudden emergencies. Move quickly to the nearest accessible exit. Notify, and assist others to evacuate along the way. If the building fire alarm is not yet sounding, manually activate the alarm pull station located near the exit. “Area of Gathering” and “Area of Relocation” information for each building is posted in the lobby, and is listed on the Fire Safety website. From a safe location call 617.627.6911 (x66911 from a campus phone) to provide details for first responders. On the Boston health sciences or SMFA campuses call 911 first to provide details for first responders. Relocate to an entry to an evacuation stairwell, marked by a red EXIT sign. Call University Police at 617.627.6911 (x66911 from a campus phone) to notify a dispatcher of your location, identifying the stairwell number or a nearby room number. 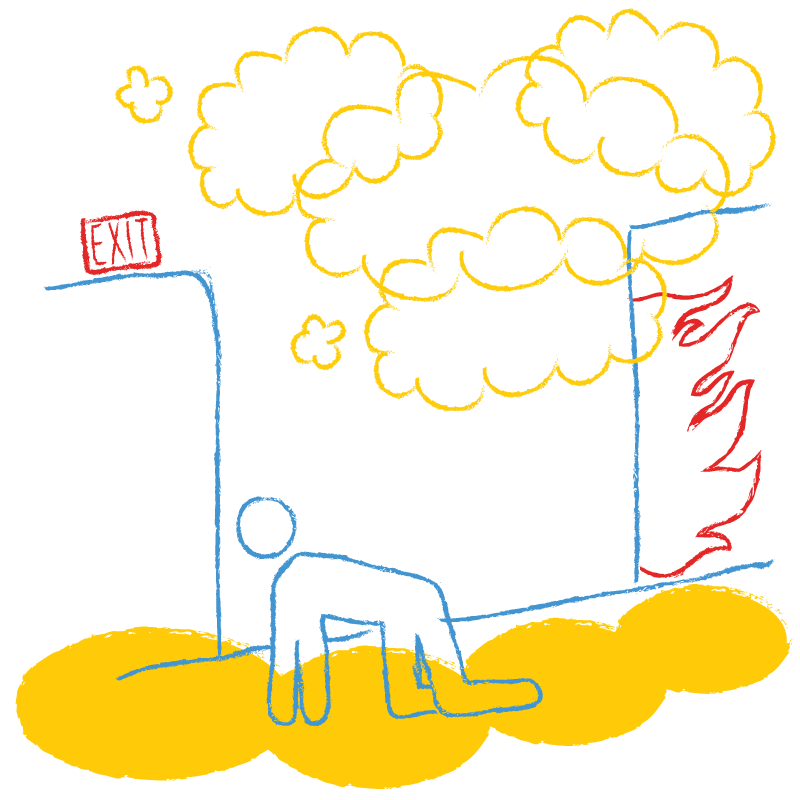 Wait NEAR the enclosed exit stairwell if there is NO smoke or other threats to your safety. Most fire alarm activations are brief, allowing occupants to return within a few minutes. After the stairwell crowd has passed below your floor level, enter the stairwell with assistant(s) and wait on the stair landing. Make sure that the door is securely closed. Update University Police at 617.627.6911 (x66911 from a campus phone) to notify dispatchers that you have relocated INTO the stairwell. Wait for assistance. First responders will be assigned to assist you if evacuation is necessary. Only if you are trained and confident in fire extinguisher use. Only if the fire is small in size (no larger than a small trash can). If you do fight the fire, use only ONE (1) extinguisher, then evacuate the building. As a reminder: you are NOT obligated to fight fires of any size. If you have any doubt, do not attempt to fight the fire. TOTAL AND IMMEDIATE EVACUATION IS THE SAFEST. Call University Police: 617.627.6911 to report your location and conditions. Drench with water if a laboratory safety shower is immediately available. Report ALL fires, no matter how small, to the University Police at 617.627.6911 (x66911 from a campus phone). On the Boston health sciences and SMFA campuses call 911 first to report a fire.